Evidence of political polarization can be found in many aspects of American life. It’s not just about the public’s views on issues, but the way they use media (including social media) and talk about politics with other people, according to a new Pew Research Center data analysis drawn from a representative sample of online adults. While the most consistent liberals and conservatives both tend to drive broader political discussion, they do so with news and analyses drawn from very different segments of the media landscape. 1Consistent liberals trust more news sources than consistent conservatives. Those with across-the-board liberal values have, on average, heard of more sources than those in any other ideological group, and trust about twice as many as they distrust (10.4 vs. 4.8). 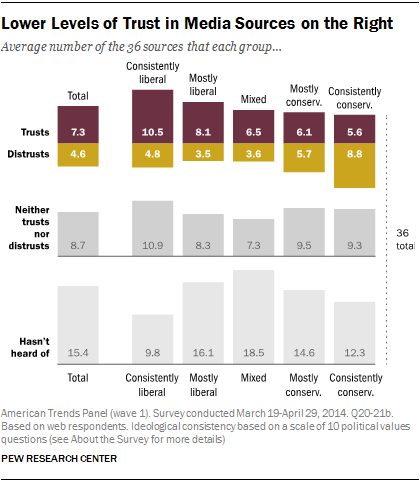 In contrast, consistent conservatives distrust more sources than they trust (8.8. vs. 5.6). 2Consistent conservatives and consistent liberals talk more about politics and enjoy doing so more than those who are less ideologically consistent. About two-thirds (68%) of consistent conservatives and 57% of consistent liberals say they talk about politics at least a few times a week, compared with 42% of all respondents. 3Consistent conservatives cluster around a single news source: 47% cite Fox News as their main source for news about government and politics, with no other source even close. 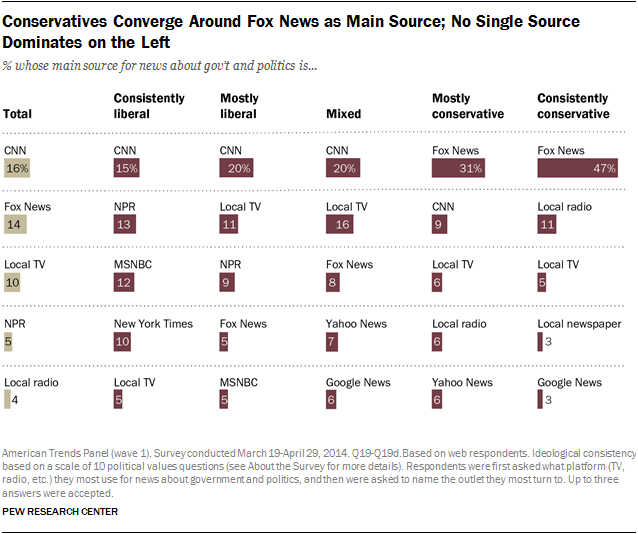 Consistent liberals list a wider range of news outlets as main sources — no outlet is named by more than 15%. Among the top sources for consistent liberals: CNN (named by 15%), NPR (13%), MSNBC (12%) and The New York Times (10%). 4While it is a dominant source for conservatives, Fox News draws a significant portion of its audience from across the ideological spectrum. Though 46% of its audience is right-of-center (compared with 26% of all respondents), 37% of its audience comes from people with about an equal mix of liberal and conservative views, and 18% comes from those to the left of center. MSNBC, which many view as a liberal alternative to Fox, draws 33% of its audience from those with mixed political views, while 26% are mostly or consistently liberal and 18% are conservative. See our full list and interactive on news audience profiles. 5Consistent liberals and conservatives who use Facebook are more highly engaged with political news than less ideologically consistent users. Two-thirds of consistent conservatives who see political posts on Facebook pay “a lot” or “some” attention to those posts. 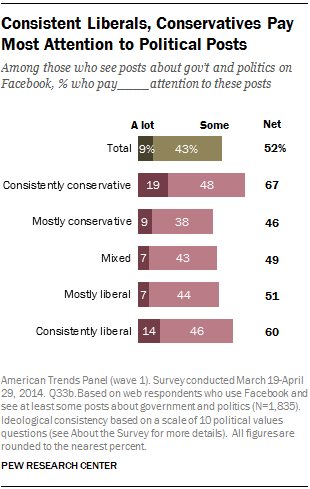 Similarly, six-in-ten consistent liberals who see political posts on Facebook pay “a lot” or “some” attention.